Colors: Matte Gold or Matte Silver. Ships In: Full Color - 10 to 28 Business Days (after artwork approval); Die Struck - 28 Business Days (after artwork approval). 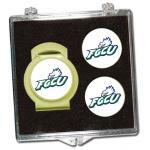 Features: Corporate gift set includes 2 extra ball markers with your custom logo. Epoxy cover comes in either flat or domed. 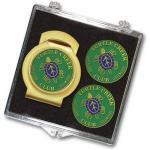 Custom Logo Golf Hat Clip Gift Set. 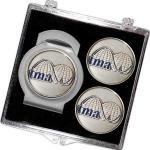 These clips conveniently attach to your visor or your pocket, clip to your belt loop, slide on to the side of your hat or any other accessible location. Great for holding your ball markers! Make great gifts for your next golf tournament. Price includes full color logo. These customized and stylish clips conveniently attach to your visor or your pocket, clip to your belt loop, slide on to the side of your hat or any other accessible location. Great for holding your ball markers! ..